I decided to host a small get together for a couple friends to watch some not to scary Halloween movies. I gathered up some of my old favorites like Hocus Pocus, Scream, and Ghostbusters, scoured Pinterest for some festive printables, and put a few snacks together. I decided to go old school and send actual, snail mail invitations. I used these Bag of Bones invitations. 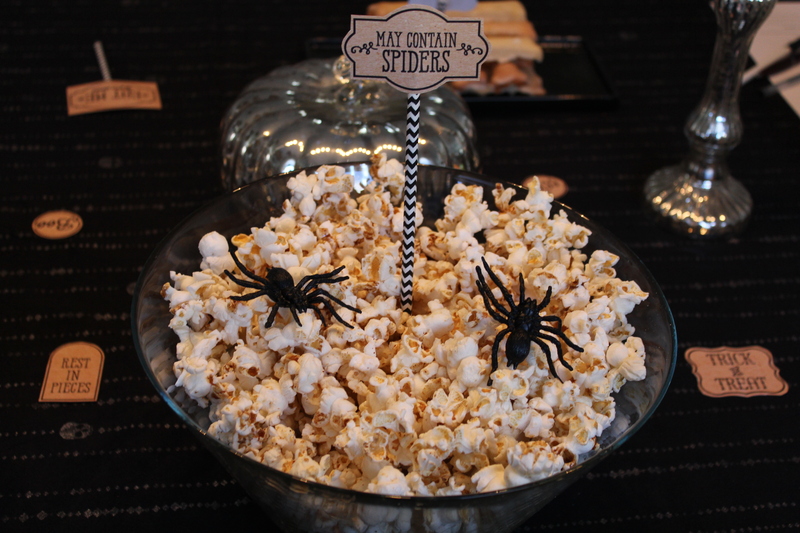 To enjoy with the movie, I made this fall spice popcorn (which I also made for a Halloween party 2 years ago). It was easy and delicious. Don’t eat the spiders – they’re plastic and came in a pack of 12 for $1 at Dollar Tree. The craft paper looking printables with funny phrases like “May Contain Spiders” “Probably Poison” and “Absolutely to Die For” are free from here. Those black chevron paper straws I used as food picks for the labels were a steal from Dollar Tree. I bought a Wilton bone pan on clearance at Target last year, so when I saw these Dusty Bones sugar cookies bones on Pinterest, I knew I had to give them a try. I didn’t have white food coloring, clear vanilla extract, or unsweetened white cocoa, so I went without. 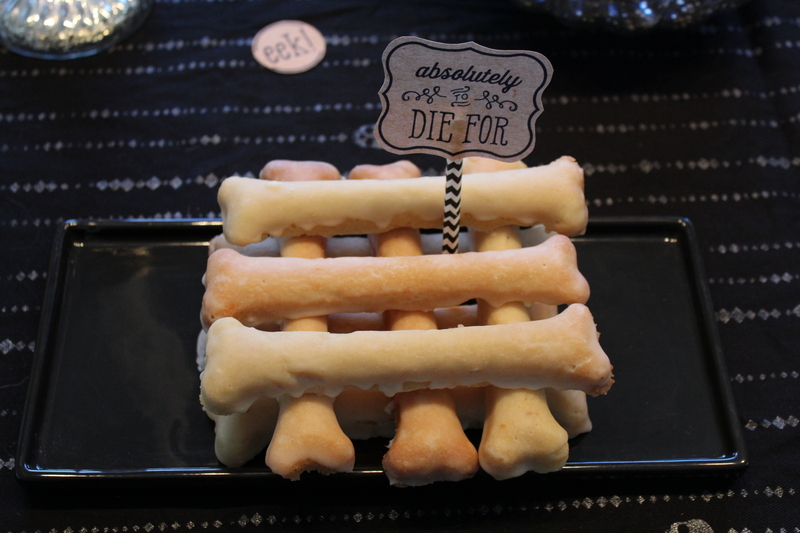 As a result, the bone cookies were more of an almond color. Still tasted great! 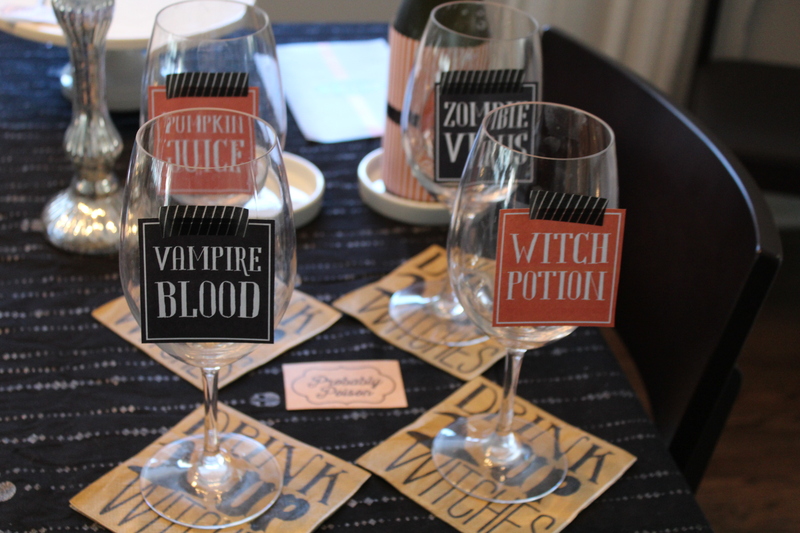 For makeshift wine glass markets, I attached these potion label printables to my large outdoor wine glasses with black striped washi tape. 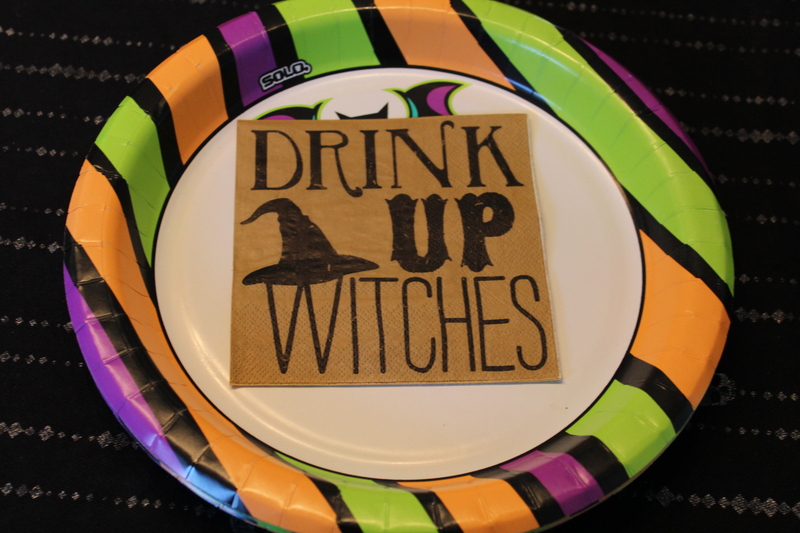 Just for fun, I couldn’t resist these cute napkins that say “Drink Up Witches.” They were a Marshalls find for a couple dollars. 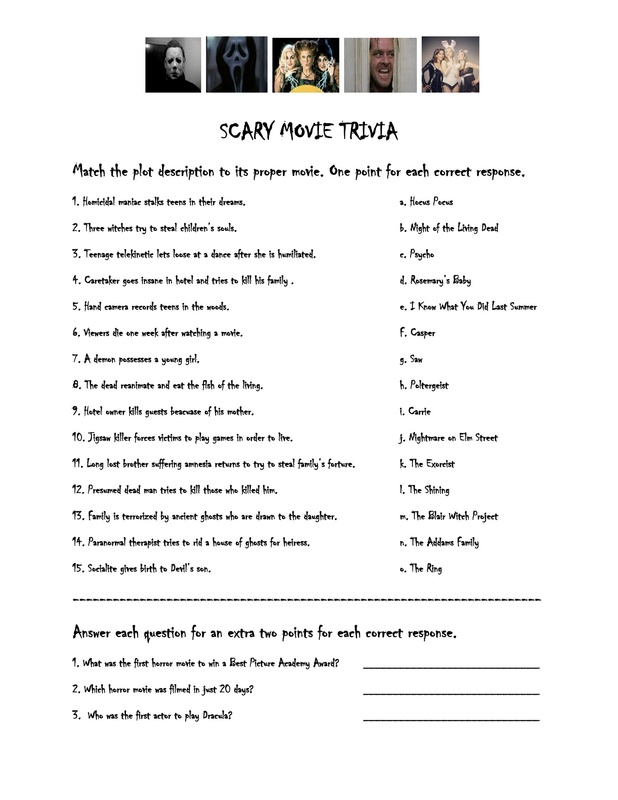 And finally, I made this Halloween movie trivia game to play in between movies. I’d still call it a win. It was a spooky good time! Thanks! Hi there. I’ve gotten some readers asking for an answer key. I actually had never made one. Here it is now: 1. j; 2. a; 3. i; 4. c; 5. m; 6. o; 7. k; 8. b; 9. c; 10. g; 11. n; 12. e; 13. h; 14. f; 15. d. The three write in answers are: 1. Silence of the Lambs; 2. Halloween; 3. Bela Lugosi. Hope you have fun playing this trivia game!